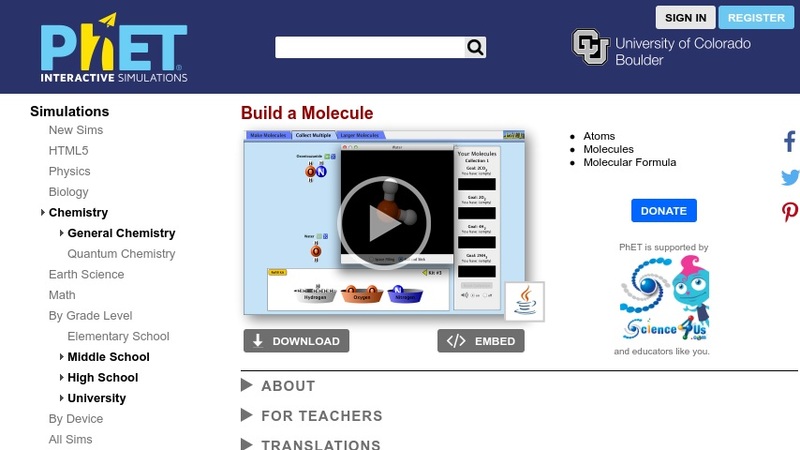 Students will have fun constructing simple molecules with this simulation, while also gaining insight about how to read molecular formulas. Click and drag atoms to see which ones bond to form diatomic molecules (composed of a pair of the same element.) Drag different atoms into the field to build a more complex molecule composed of different elements. After a molecule is built, it can be viewed in 3D models. The simulation was designed to help learners recognize that the subscript in the molecular formula indicates the number of that atom in the molecule, and the coefficient indicates the total number of molecules. More advanced learners can explore covalent bonding and electron sharing. This lesson is part of PhET (Physics Education Technology Project), a large collection of free interactive simulations for science education.